Was it a budget to 'win grey votes and capture the spirit of Thatcherism'? Or a ‘Lamborghini ride that says power to the people’? As the debate over George Osborne’s fifth UK budget continues, we take the opportunity to delve into the archives of the Research Digest and The Psychologist in order to consider the importance of the economy, ‘austerity’ measures, and the conservative / liberal divide. The group argue that there are other ways of doing psychology, and that the articles in their special feature ‘point the way towards a far more socially aware (and arguably more scientific) version of the discipline.’ Coming just seven months after a ‘discussion special’ of The Psychologist on the same topic, this is likely to remain a popular and controversial issue for professional psychologists and we welcome your views. But how important are these issues to the average voter? ‘It's the economy, stupid’, was Bill Clinton's campaign mantra back in the nineties. But according to this Digest item from 2005, it's actually not. An analysis of British voting behaviour in the 1997 and 2001 general elections suggested that our political allegiance colours how we judge our financial situation, rather than the other way round. That's despite the fact that people think that money affects happiness more than it actually does, massively underestimating the happiness of people on lower incomes (see also ‘How much money to make you happy?’). Osborne’s budget was widely interpreted as an attempt to give something back to savers. Way back in 2002, an ‘Action plan’ on the economy in The Psychologist advocated the fostering of a culture of saving. But are there individual differences between those who choose to save and those who don’t? This Digest item from 2007 found that successful savers differed from the failed savers in what the researchers called their 'time horizon' – that is, the time they said was most important to them tended to be further in the future. The focus on savings may play well in the Tory heartlands and traditional demographic, but if the Conservatives are looking to win new votes, they could do worse than getting people to think about their own death or maybe not think at all. Prime Minister David Cameron could look to the psychological research to promise greater happiness for Conservatives, although perhaps at the expense of creativity. 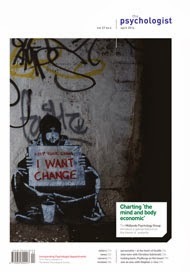 Whatever your political persuasion, we hope you will find our archive offerings of use in understanding ‘the mind and body economic’, and how it may be affected by the current climate. As ever, psychological research is at work throughout society, and professional psychologists on the ground are seeking to ensure well-being for all – the ‘haves’ and ‘have nots’.